Some 84 percent of UK middle-schoolers believe “racism against whites” is ignored, 60 percent say asylum seekers and immigrants are stealing jobs, and more than 30 percent say Muslims are taking over England, according to an extensive new academic survey. The pressure group Show Racism the Red Card (SRTRC) sent surveys on hot-button race and religion issues to English schools between 2012 and 2014, which were completed by 5,945 children aged 10 to 16. “We have found that there is a large amount of negativity when young people are asked questions about immigration or Muslims. This survey shows that this is fuelled by a totally distorted view of the number of immigrants and Muslims living in the UK,” said SRTRC chief Ged Grebby. Asked to guess the percentage of the UK’s population that was born abroad, the pupils estimated 47 percent, whereas the last census in 2011 said 13. Middle-schoolers classifying relations between Muslims and other social groups as poor amounted to 46 percent, while 41 percent said that forced marriages are common in Islamic communities, and 26 percent said the religion encourages terrorism. “There is clearly a gap between the reality and perception on issues like the number of immigrants or the size of the UK’s Muslim community among some young people. The subsequent levels of hostility towards these groups is very worrying and is something that we, as a society, need to take seriously,” Paul Jackson from the University of Northampton, who helped to devise the survey, told the Guardian. Not all answers were negative – 49 percent said they believed Islam itself was a religion of peace, with only 14 percent disagreeing (others were undecided). 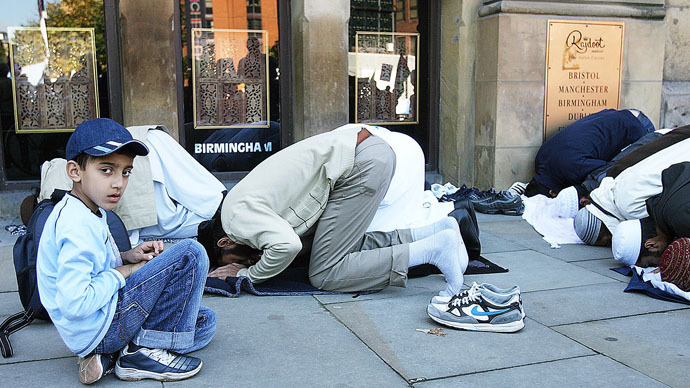 Some 35 percent said that Muslims, who actually constitute about 5 percent of the UK population, are making a positive contribution to society, with only 19 refusing to accept that statement. The children also showed a degree of self-awareness, with 72 percent saying stereotypes are dangerous, and three-quarters claiming that newspapers may contribute to racism. “This is not evidence of widespread racism among young people but it is clear there is a large degree of anxiety – often based on inaccurate information – about what is happening in their communities and about their own futures,” said Hilary Pilkington from the University of Manchester.